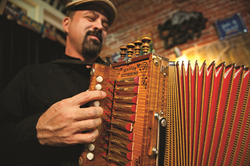 Throughout Southwest Louisiana, there are many ways to enjoy the local sounds. Being the Festival Capital of Louisiana with over 75 festivals annually, two summer festivals in particular showcase some of the best local and regional bands. Music traditions run deep in Southwest Louisiana. For generations, folks here have immersed themselves in the melodies, dance steps and lyrics of Cajun, Swamp Pop and Zydeco music that express the essential necessities of everyday life: family, relationships, food and fun. Celebrating these unique cultural elements is essential to their preservation within the community. The Cajun French Music Association (CFMA) continues to work and interact with the Lake Charles community to preserve the area’s rich Cajun heritage. They offer Cajun dance lessons on the 3rd Thursday of every month, Cajun jam sessions on the first Friday of every month as well as hosting Cajun language classes at the CFMA Building. The 29th annual Cajun Food and Music Festival will be held Friday and Saturday, July 15 - 16 at the Burton Coliseum Complex. This festival aims to preserve the Cajun traditions and heritage through music, dancing, and food. Savory Cajun dishes including jambalaya, gumbo, cracklins and more will be in high supply at this event, along with raffles, a live auction, arts and crafts booths, cake walks and games for the kids. The festival will end with a free Cajun mass on Sunday morning at the CFMA building located at 3481 E. Prien Lake Road. The 26th annual Marshland Festival will be held Friday and Saturday, July 29 – 30 at the Lake Charles Civic Center. Selected as one of Southeast Tourism Society’s Top 20 Events for the month of July, Marshland Festival celebrates authentic Louisiana culture, Cajun food and music. From Zydeco, Oldies, Cajun and Country there is always a tune to get the crowd on their feet dancing and celebrating. Download the free Lake Charles Events App to stay up to date on all events and entertainment happening in Southwest Louisiana. For information about all festivals and events happening in Southwest Louisiana, visit http://www.visitlakecharles.org/events-festivals/events.